Welcome to the year's first Cherry Blossom Watch update! As we gear up for getting the bottom end of a big storm to hit the northeast, this is how the cherry blossoms look as of January 25. And for reference, here's how they looked almost exactly a year ago. Although it hasn't been especially cold in the past week or two, there's a layer of ice over about half of the Tidal Basin. The storm that's coming should add a bit of snow over the next couple of days. It's not clear yet how much, but it won't be anything like what the regions around New York and Boston are expecting. But still, temperatures so far aren't set to plummet to the extent they can. Overall, the winter temperatures so far have been about normal. We haven't had the sustained cold temperatures of last year's winter-that-would-ever-end. Although it's still too early to make predictions on when the cherry blossoms will reach peak bloom, the more normal temperatures we've had so far this winter hints at a more average peak bloom date and earlier than the late bloom we had last year. Over the next few days I'll add a post with a detailed comparison of the temperatures we've had so far this year compared to previous years. That will give some indication of how this year's peak bloom forecast should shape up as compared to previous years. Below the photos you can find some interactive virtual tours if you'd like a 360° view. Prefer a 360° view? 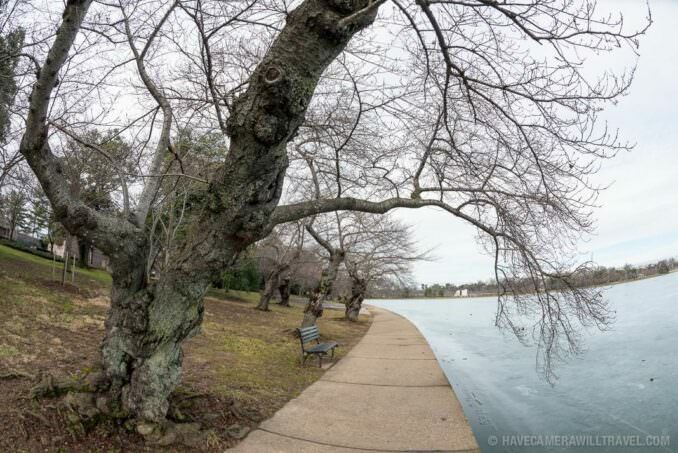 Here are some panoramas taken the same day from the Tidal Basin's shore along the FDR Memorial. And here are a some shots from two weeks ago.